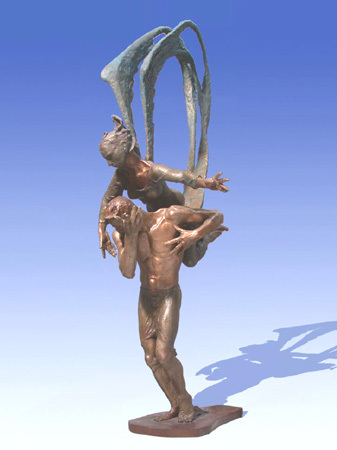 The two figures in this sculpture, the mourner and his Angel, sum up two extremes: the depths of human grief and the uplifting spiritual energy that makes our deepest sorrows bearable. Everyone who has ever had a moment of utter sadness can relate to this male figure, bent and burdened by the enormity of loss. By the same token, anyone who believes in the realm of spirit knows that even in our darkest moments there is a benevolent, healing energy such as this angel made available to us.